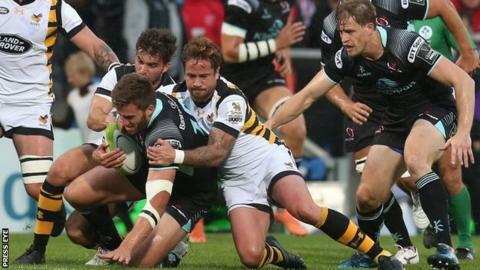 Tommy Bowe made his return to action after almost six months out as Ulster lost 26-15 to Wasps in Thursday's pre-season game at Kingspan Stadium. Bowe came on for fellow international Stuart McCloskey who was forced off before half-time by a hand injury. McCloskey sustained his injury after being stood on and he is expected to undergo an x-ray. Bowe, out of action since Ireland's Six Nations game against Wales in March, operated as centre after coming on. The Monaghan man normally plays wing although he has lined out at full-back for Ulster on many occasions. Wasps led 14-8 at half-time with Peter Browne's Ulster touchdown coming either side of Wasps scores by Craig Hampston and Simon McIntyre. A Callum Patterson try helped nudge Ulster 15-14 ahead but touchdowns from Josh Bassett and Danny Cipriani saw Wasps fight back to win. Cipriani finished with 11 points for the visitors.